Am I excited to hear about any of those??? I don't know. Mannequin maybe. Cop (1988) starring James Woods and Lesley Ann Warren comes to Blu-ray later this year. yeah i second that,james woods was terrific in cop,i'll definitely look at upgrading from dvd if the price is right. might grab it of my shelf again soon as it's been a while since i last viewed it! i havent seen it since it was released at theatres. So its held up well Warrior? Woods steals the whole show--in fact, he is the whole show--in one of his best, most manic performances in Cop. Director James B. Harris, didn't direct many films, but what he did was always interesting: The Bedford Incident, Some Call it Loving (which I believe is also new to Bluray), Fast-Walking, Cop, and Boiling Point. The film was based on a James Ellroy series of books about cop Lloyd Hopkins. It's a shame that they didn't make any more. That's one I'd like to watch crash which you mention - fast walking with James woods and Kay lenz and also 1979s - the onion field is another woods movie I would like to check out! Ooh, i have that one ! It was the first release on Vinegar Syndrome's brand new sub-label Etiquette Pictures. The American Dreamer (1971) will be their next release, coming in september. Good stuff ! JRiR, I'm glad someone else is familiar with the really obscure Some Call it Loving. I saw it many years ago--sometime around 1981--and have always remembered it for its unique plot and ambience. I can't say that it's a complete success, but it sure is an interesting film--and it has a young Richard Pryor too. YW, Woods gave some sensational performances between 1979 and 1989, starting with The Onion Field, which is one of his best. In fact, just about everything he did during the 80s was memorable: Split Image, Videodrome, Cop, Salvador, Once Upon a Time in America, Against All Odds, The Boost, Best Seller, True Believer...just an amazing body of work. Even when the film itself didn't quite work--Against All Odds--Woods was always fantastic. I haven't seen it yet. But anything the fine folks at Vinegar Syndrome come up with is worth my money ! Kino Lorber is going to release Up the Creek (1984) later this year. It´s definitely time to revisit this one! And i agree that all the James Woods films mentioned are excellent stuff! Still don´t have Fast Walking though. One of the big things about these Blu Ray releases is that many of them also come with concurrent DVD releases for those who haven't got Blu Ray players. Some of them have nice new special features included, but it's a royal pain trying to find out what ones have what. Olive Films for instance - don't bother listing special features on many of their films, even when they have them - why?! Deadly Prey - the greatest action movie of all time - is getting a release this year. It was sad to hear that Deadly Prey writer/director David A. Prior died last weekend. I´ve never seen Deadly Prey but i have some other films he did, Killzone (1985) for example. Maybe it´s time to watch this stuff. Nightmare Weekend (1986) scheduled for a september 22nd release courtesy of Vinegar Syndrome ! I'm Gonna Git You Sucka (1988) comes to Blu-ray later this year. Sad. Rowdy Robby Piper, Amanda Peterson, Christopher Lee, Yvonne Craig - people are dropping like flies. Secret of my Success is a good movie but i don´t like the new cover art. 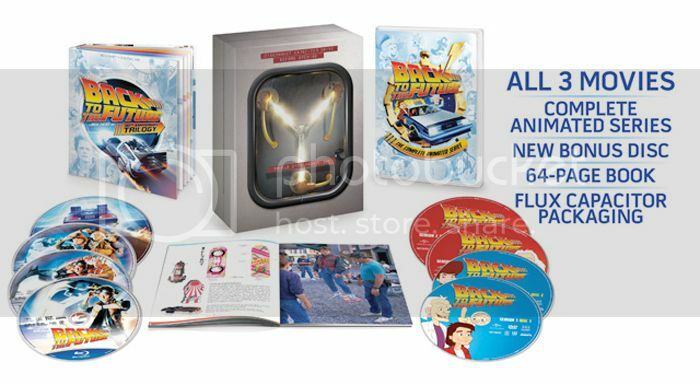 Back to the Future 30th anniversary Flux Capacitator Edition coming soon. Never seen the animated series before. Is it bad or really bad? Great film but why did universal not stick with something similar to the original art,pity they are not like arrow films with there reversible cover artwork. Coming to blu ray December 15th 2015 from scream factory are - eliminators (1986) and the dungeon master (1984) double pack and zombie high (1987) starring Virginia Madsen and Sherilyn fenn. Also the 1962 movie - the brain that wouldn't die. I'm mucho cheesed that Dungeonmaster / Eliminators is not a DVD Blu Ray combo.